The only class that gets to a low hand-size near turn 7 or near the end of a game without losing from there on is heavy control decks, which won't bother with something this trivial, and Hunter, which has no business running cards as slow and Han'cho and Soggoth. Stop looking at decks that exist, and start thinking about what decks could exist. To be fair, in his guild (especially in paladin), he's going to be a LOT bigger than just a 5/6. Also, imagine a 10/14 Soggoth the Slitherer. Don Han'Cho wish your legendary was interesting, unlike me? 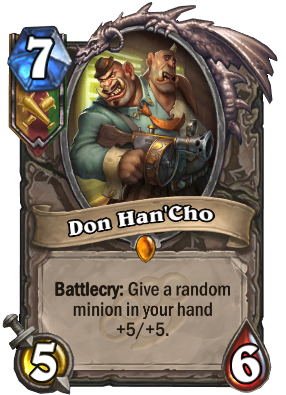 Don Han'Cho wish your legendary was unique, unlike me?